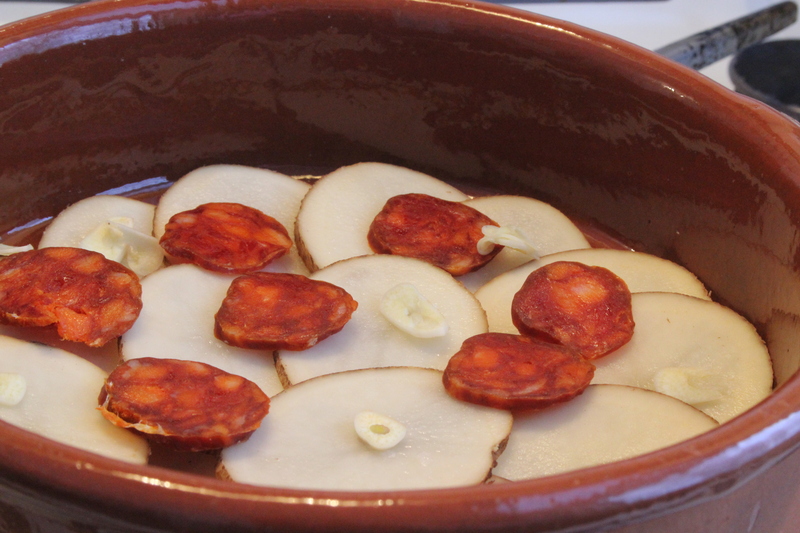 Spanish Chorizo is such a great ingredient (not to be confused with its spicy Mexican cousin). 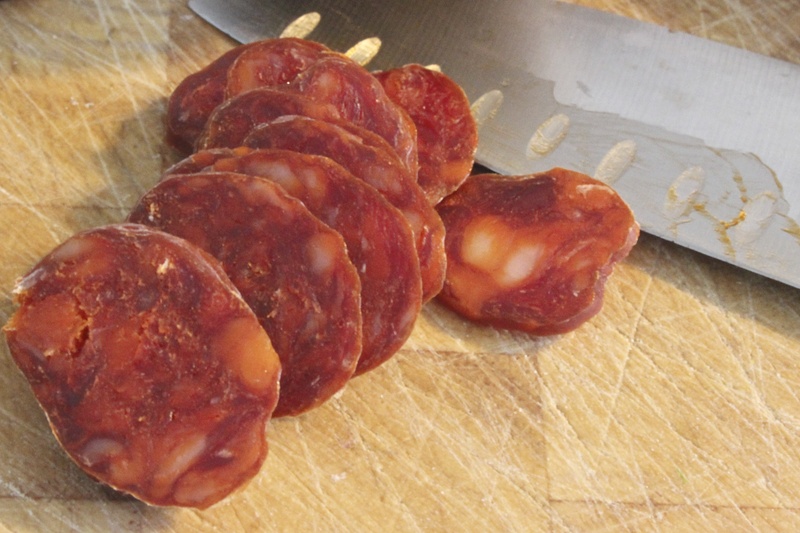 Spanish Chorizo is a pork sausage that has been spiced, cured and dried. The key ingredient is paprika which not only gives it a distinct red color, but also a slight heat. 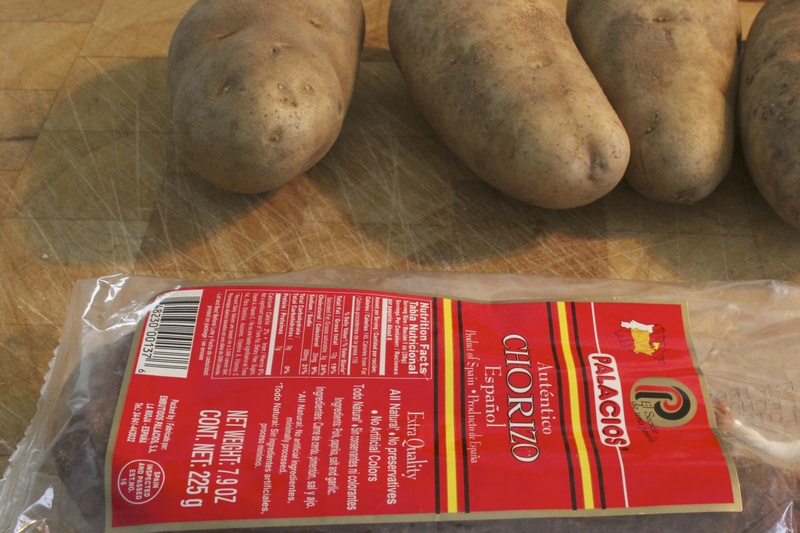 This Palacios Chorizo is the best I have found so far in the US and you should be able to find it a good deli or specialty food store. This recipe was born out of necessity when making a family dinner and we had to use what we had. As what we had was a pork loin, we had some peas and needed something to change up the potatoes. 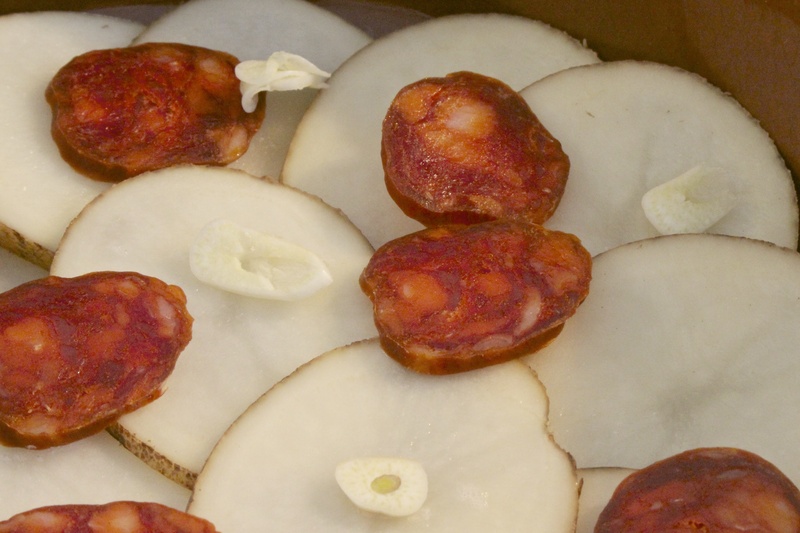 Start by slicing the Chorizo …..and resisting the urge to eat too many of the slices before making the dish. 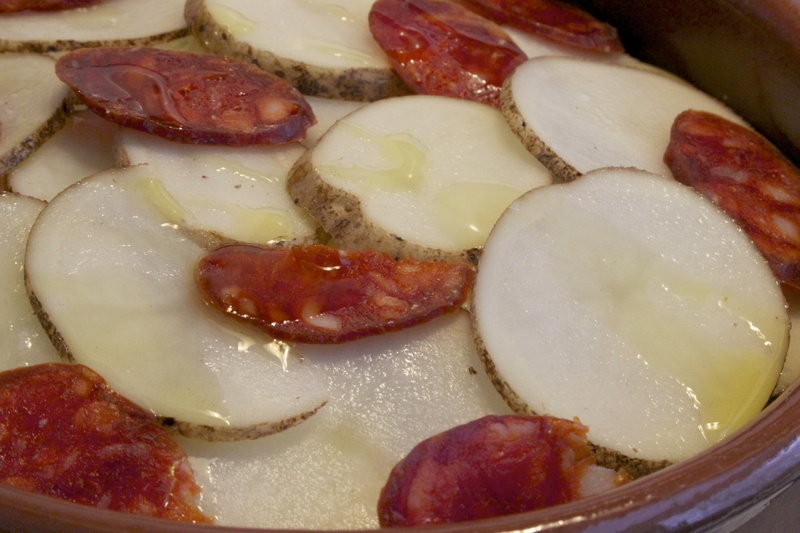 Slice the garlic thinly then layer the potato, Chorizo and garlic – lightly seasoning each layer as you go. Pour the water into the pan then drizzle the top with olive oil. 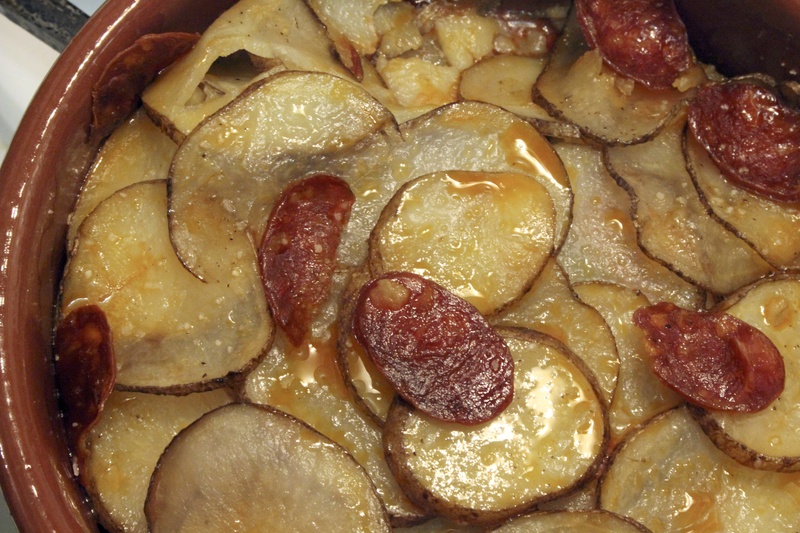 Cover with tin foil then bake in a 350f oven for about 30-35 minutes until the potatoes are very tender. Remove the tin foil and brown for a further 7-10 minutes. Remove from the oven and the dish is ready to eat. This is a great accompaniment to a weekday family meal. 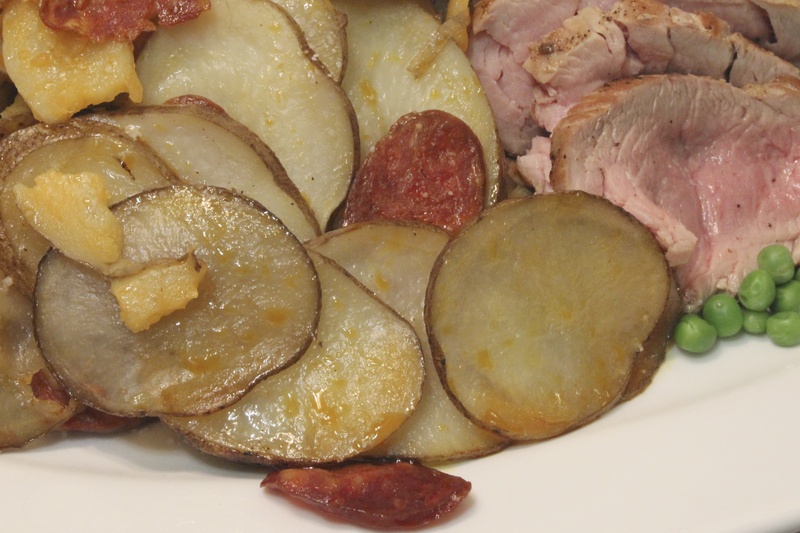 The potato has such delicious flavor that we found everyone wanted seconds …and thirds! Next time we will just have to make double.